We spent two nights at the Suwanee River Rendezvous RV Park, a great place for, well, rendezvous--meet ups--of RV groups. The new part of the park was rather run-of-the-mill, with average RV sites, few trees, and little shade. The older part of the park, directly situated on the Suwanee River, was wooded. It would be difficult to get any big rigs in there, but there was an abundance of shade from the live oaks throughout the area. We were disappointed, however, with the fishing facilities. The park promised fishing. Technically, there were areas to fish from the shore, but they were difficult to reach. The banks were steep, with little actual shoreline. No pier. No benches. We managed to climb over tree roots without falling into the water and find some areas to fish, but we did not catch anything. We were also disappointed that the park did not offer anything else other than the natural springs and a heated swimming pool for amenities. No pool table. No library. Nada. In the heat of the afternoon yesterday, we became very, very bored. Too hot to fish; no desire to go to the pool. Our stay was a BOGO--buy one night, get one night free. When our BOGO deal was done this morning, we packed up and drove about 30 miles up the highway to another Suwanee River RV resort--this one called the Spirit of the Suwanee Music Park. It claims to be world class. It is not. But it is unique. 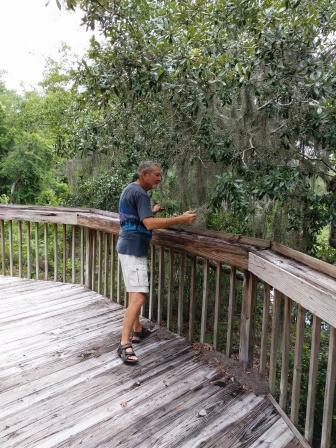 That is Jim, taking a look at the river flowing below the deck. Peeking out among the live oaks is the Suwanee River. The light area in the center of the photo is the Suwanee River meandering along the park's border. Huge live oak trees with gossamer Spanish moss grace the RV park, which approximates the size of a small state park. This place is a private park, but has acreage to rival a small state park. It boasts more than 800 camping spots that can accommodate every type of camping from tents with no hookups to big rigs such as ours, tohorse camping. Unfortunately, although it has some full hookups, it has very few 50 amp service sites, which puts a crimp in using two air conditioners. 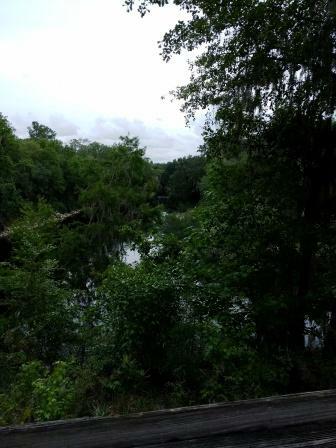 The park, however, has hiking trails, canoeing and kayaking availability, a swimming pool and playgrounds. No community center, though, and no pool tables. It took us more than an hour to drive through the campground to see all it offers, it is that big. Its call to fame is music, as it hosts music festivals throughout the year. Some of these festivals attract upwards of 5,000 people, and music is played in many different venues throughout the park. Most of the festivals are in the spring and fall, although there is a small one scheduled for this weekend. 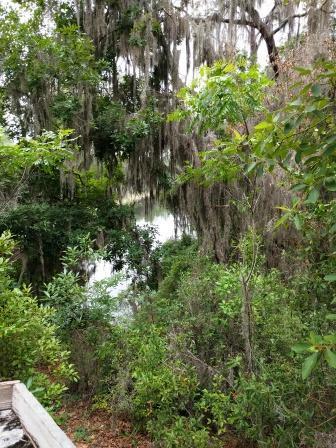 The river banks in this park are quite steep and sheltered by live oaks, but we found a man-made beach area where we can easily reach the river to fish. However...it is raining. And it will probably rain tomorrow also. (There is a threat of a tropical storm, and the outlook looks very wet for the next week.) So, we probably will not be able to fish here. One nice thing: this park has excellent fast, free wifi. And, because no major festival is scheduled for this week, the park is virtually empty. And, I forgot to mention, our two days here are free. I don't think we would return to either of these parks. The fishing is not good, and there is really nothing else to do, unless you want to hike in the woods. Originally we had considered going up to the Panhandle to stay at Ho-Hum RV Park, directly on the Gulf of Mexico. However, because of the weather threat, we will be heading home. But, you know what? Rain or not, blistering temperatures or not, we have had a wonderful time. We spent time with family; we got away from our usual routine; we relaxed.